From: the US, upstate New York (New York City is about 250 miles away from where I currently live, and I’ve only visited there twice in my entire life!). I’ve been all over upstate - my childhood home is in Cattaraugus County (about 2 hours west of where I am now, and where my parents still live), I went to graduate school in Albany, and I spent a couple summers working at a camp in the Adirondacks. I also lived in Erie, PA for about 8 years. Now I’m a librarian at a community college. Family: I’m married, and have one daughter who is 7. My extended family is pretty far-flung -- as I mentioned above, my parents are about 2 hours away. My younger sister lives in Kansas with her husband and 3 children, and my husband’s family is all in Iowa. 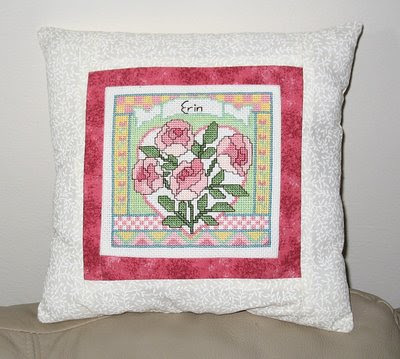 I’ve been stitching for almost 30 years - wow! 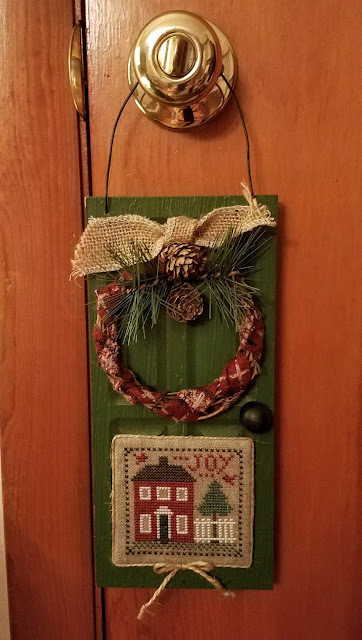 I started when I was about 13, I think, with a little 99-cent ornament kit from the craft store. I remember that it was a little farm couple that came with a little wooden heart frame, and the people had French knot eyes. 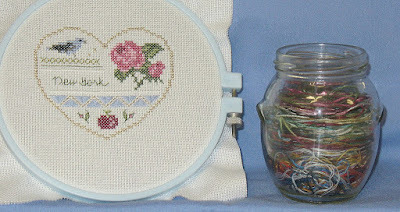 My mom, who is not a stitcher, did her best to teach me, but she hated those knots! 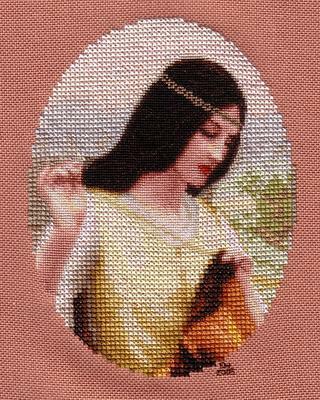 My SECOND finished piece of needlework. 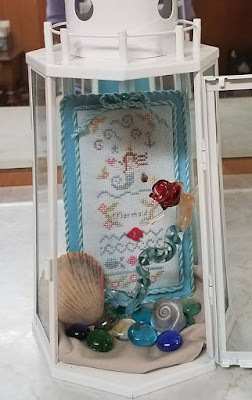 From a kit, but I personalized it with my name...and a French knot! I started blogging in 2004. 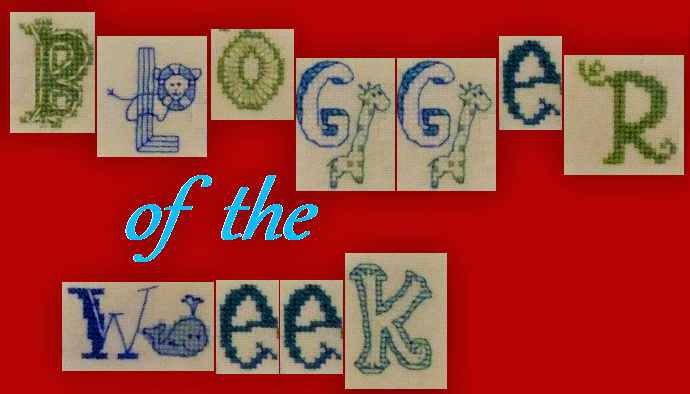 I think I was inspired by stitchers from The Wagon BB, along with the fact that I actually met my husband via blogging (not on my stitching blog, though….does anyone remember Xanga??). 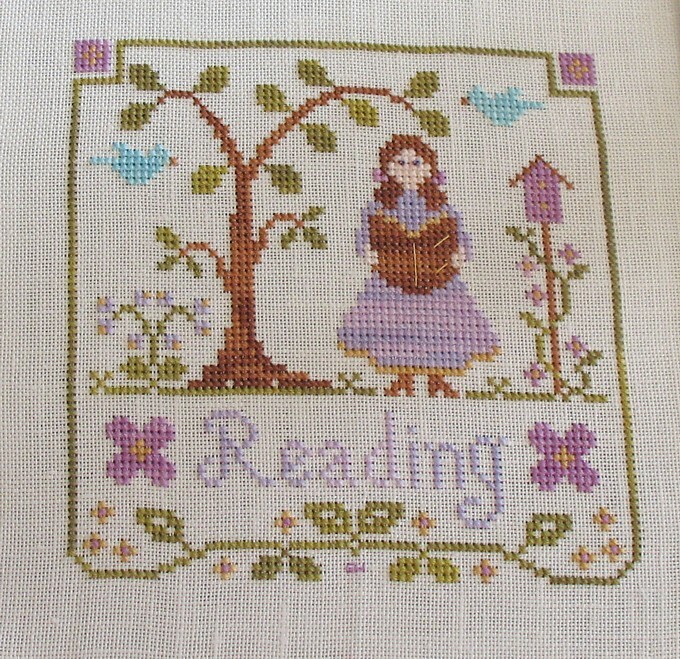 As for my blog title, back when I started it I was obsessed with just about any pattern with a fantasy or fairy tale theme. My stash of Teresa Wentzler patterns - as yet unstitched - illustrates that… And then the French knots, of course (darned little farm couple with their wonky eyes!). one of the first finished pieces I posted on my blog that seems to suit my imagination pretty well. I used to be a OAATer….then I discovered bulletin boards, eBay, and online shops….now I’m not quite a serial starter, but I DO have multiple projects going with very little rhyme or reason to which one I’ll work on next. Smalls often “take over,” because gathering supplies is quick and finishes are gratifying. Hmm. It really depends on the day! 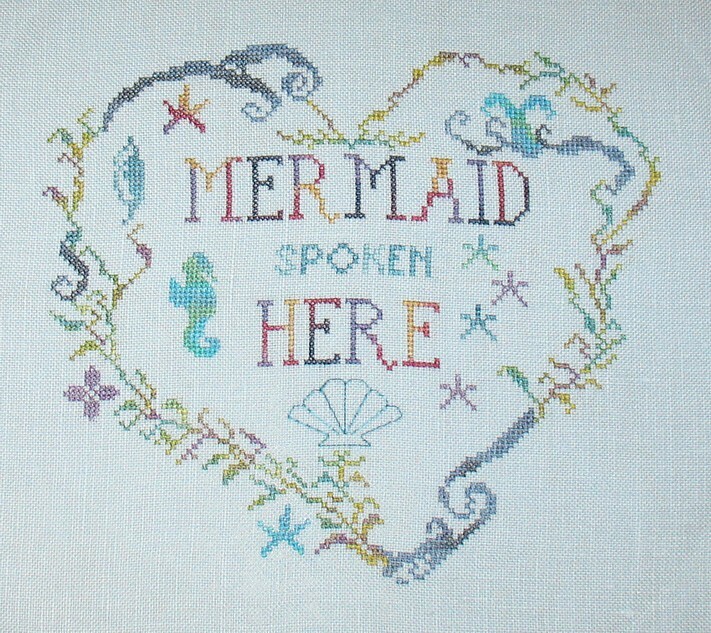 I love mermaids and aquatic designs, often regardless of designer. 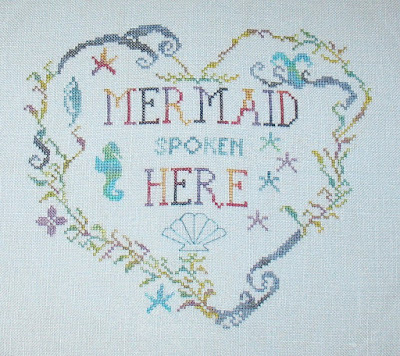 At the same time, I like unique designs - so while I love mermaids, I don’t have (or want) all of the Mirabilia mermaid patterns because they all start to look the same to me. 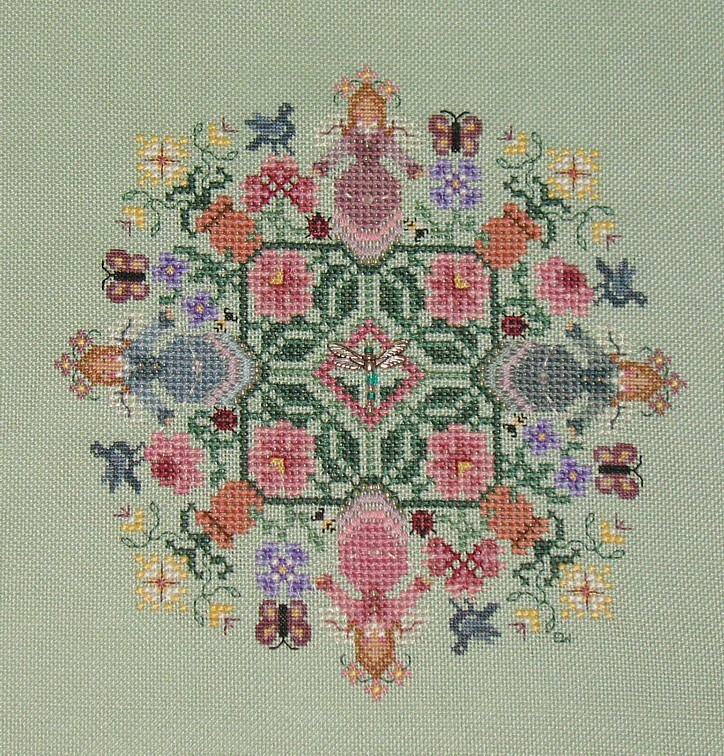 I know I have quite a collection of Cricket Collection patterns, and also quite a few Just Nans. 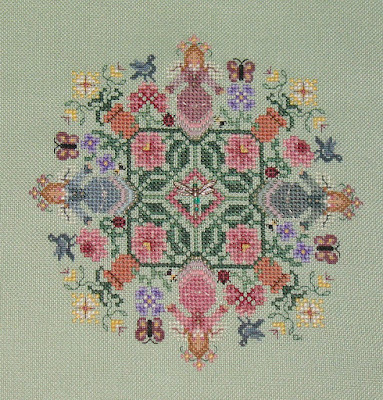 I also find something very endearing about many of Homespun Elegance’s designs, particularly the smaller ones, and the Drawn Thread. Oh gosh! 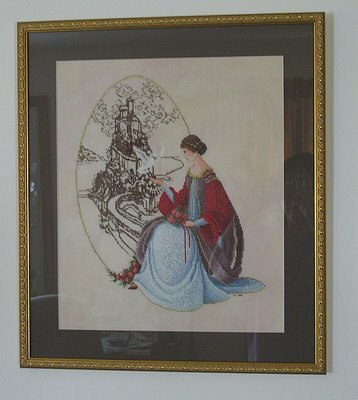 They are all favorites at some point, or they wouldn’t get stitched in the first place…but there is a special place in my heart for Butternut Road’s “Once Upon a Time.” It was one of the first big projects I finished and framed for myself. I don’t think I’ve really had one, knock on wood! 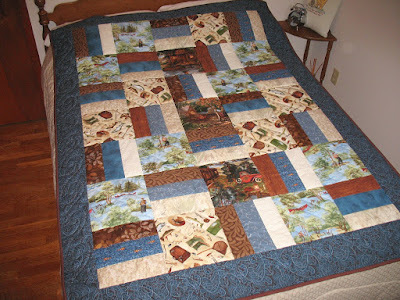 I love fabric and color, so quilting intrigues me. I’ve put together a few tops, but they were very rudimentary - just squares of different sizes and straight lines. I’m not sure I have the time, patience, or budget to go much beyond that, but I do love the finished products! Fishing-themed quilt I made for a dear friend. 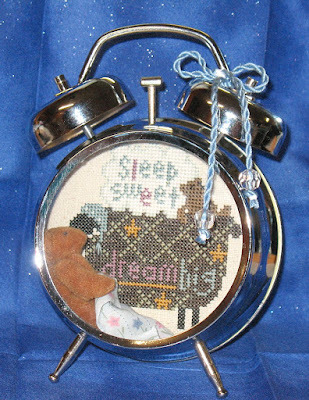 The pattern was designed for a Moda charm pack, but I swapped that right out. Oh my, do I ever have a box full! Going back decades now…. But I love finishing. I just need to find the right “things” to inspire my finishing! 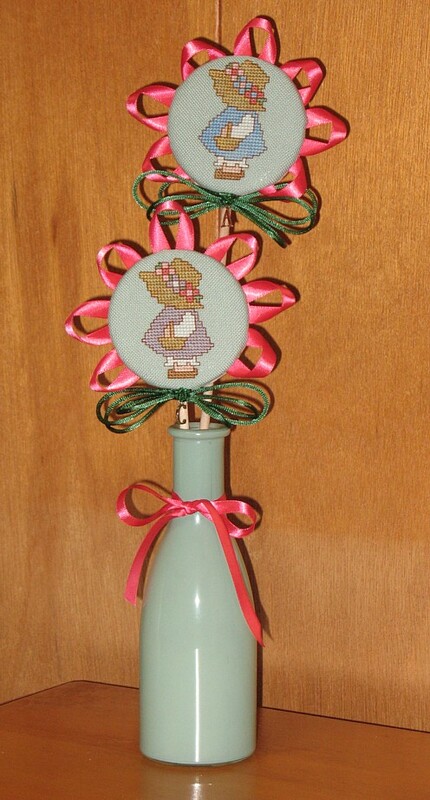 I’ve been known to wander the aisles at craft stores and thrift shops, looking for items to repurpose, attach my stitching to, etc. I have a treasure trove of boxes, frames, and other doo-dads that could have potential. I particularly love 3-dimensional kinds of finishes. Most definitely, Prairie Moon’s “Moon Dance.” I swapped out many of the colors in this piece for flosses I had in my stash, and as I was working on it, I felt that the dancing girl was my daughter, the stars represented the 3 unsuccessful pregnancies I had prior to her birth, and maybe I was the moon watching over them all. It is a tiny little piece, and I’ve yet to have it framed, but it is one that I look at often and love. I think one of my favorite “blogging adventures” was when I had the pleasure of hosting Madame Muriel, a stitching-themed Flat Stanley-style project! I’ve tagged all her travels in my blog, and I still like to re-read them and laugh. I don’t know where Muriel has got to these days, and you’ve seen her, I’d love to know! The most easterly Granny in England! It was so interesting learning more about you Erin. Thank you for sharing your special Moon Dance piece. I do remember Madame Muriel!! It was nice to meet Erin. Pleasure to meet you Erin. You have some very creative finishing techniques there, I love them! It was nice to meet you Erin. 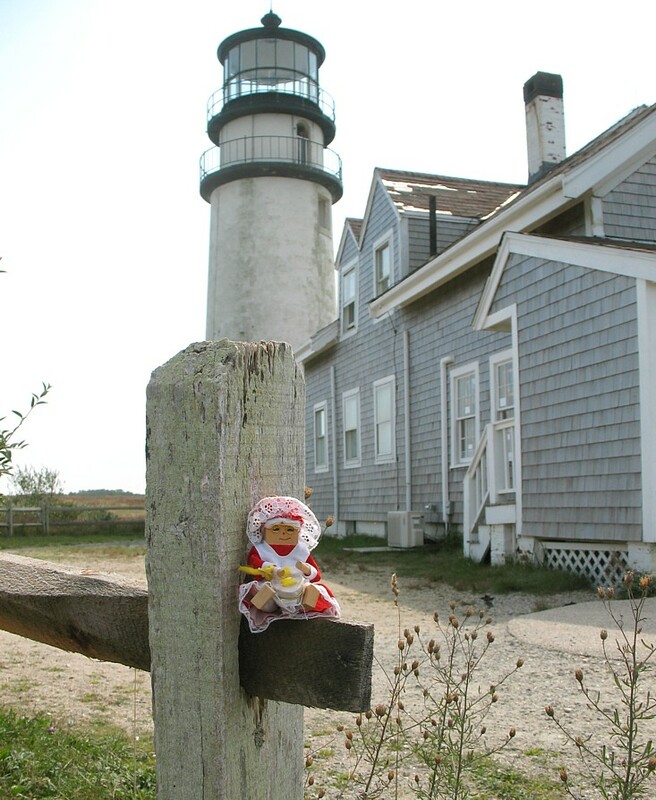 You do some really creative FFOs - I really love the Mermaid Lighthouse. Such a variety of styles and your stitching is beautiful. Nice to meet you Erin. You Moon Dance piece is very special, I can identify with your reasoning behind that one. 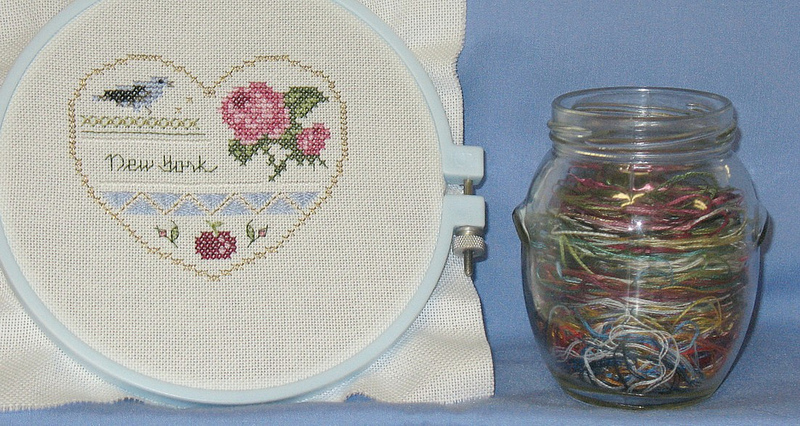 Gorgeous stitching and especially finishing Erin, you certainly have some creative ideas! 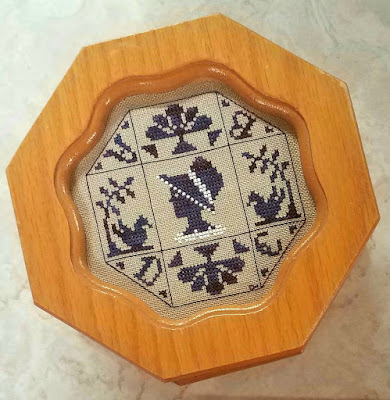 I loved the Solaria piece you shared with us, your stitching is so fine. Such wonderful pieces that you show here, Erin. And couldn't you share your finishing bug with me? LOL. That lighthouse mermaid looks gorgeous. Wonderful to meet you Erin. 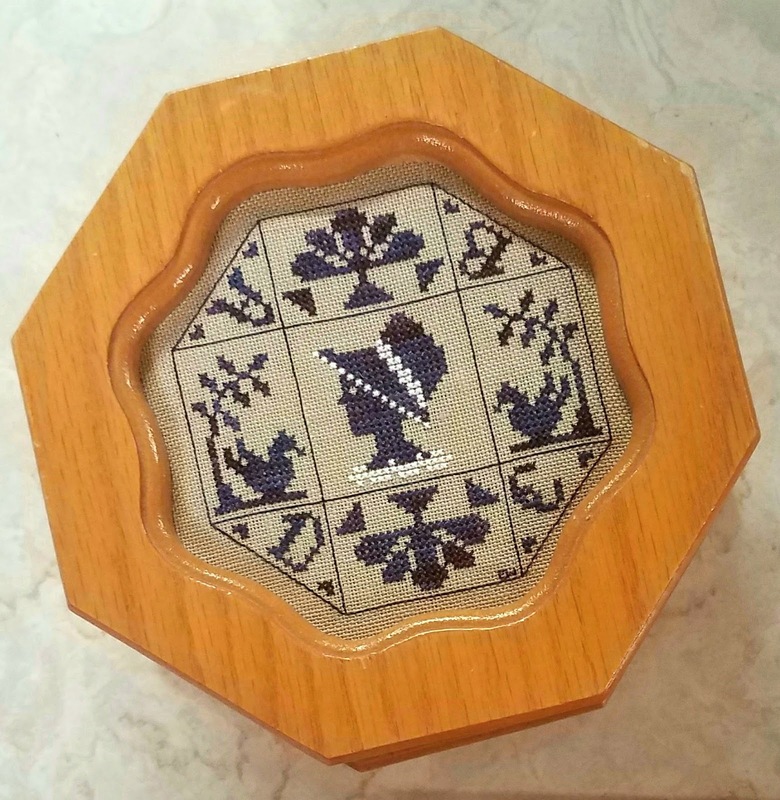 I love your finishing ideas... and your story about the Moon Dance shows how a stitched piece can truly mean more than just what the designer intended it for! I remember Madam Muriel's travels... she did have some fun!